Smooth as a baby’s what? I love fashion immensely and don’t get me wrong, I love beauty as much as the next girl, but when this little dream dropped into my hands ( okay, purposely picked via Glamour magazine), I couldn’t stop slapping it alllll over my freckled face. Like most women, skin can either consist of too much oil or too little. Depending upon the weather this can attribute to either of these types and either create the shiny (resembling sweat) or flaky snowed face. Throughout my life I’ve pretty much used Baby lotion( any brand, I’m not a poshen) and smothered it all over my body from head to toe. Not thinking that anything was wrong in doing this, constantly bought, It’s cheap and effective usage has never been outshone. 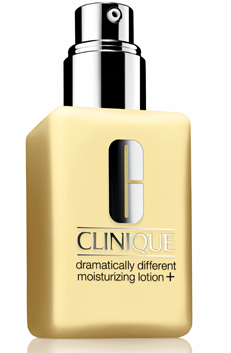 But hold those horses, there is finally a new lotion in town, roll on in Clinique and their ‘dramatically different moisturiser’. And you know what, oh it was dramatic and it was different, what an absolute moisturiser dream. ‘More moisture stays in, skin feels soft, springy and refreshed with a healthy-looking glow. ‘-stated as this, Clinique has ‘come up trumps’, with every single description ringing true. I’ll be honest, in buying Glamour magazine I had hoped to get my mits on a ‘chubby stick’ lip tint but all was left, was this. Walking out the shop in a semi mood, I went on home believing I’d got the worst of the bunch. Little did I know this would be in fact, a much better investment than that of the sticks. Having successfully tried the lip tint numerous times before, I was grasping for one of those due to their greatness. However, little did I know that the moisturiser would now be on my wish list and purchased last payday. Varying in price and in either moisturiser or a gel, Clinique had outdone themselves. Giving me a cream that left my skin feeling luscious and my bank, lots of pounds lighter. To some, this was most probably a waste of money but having used baby lotion for years you could notably tell the difference, and anything that provides a glowing tint to an ever ageing woman, is bound to be sold out. Okay, I may only be 25 but skin glow prevention is necessary from the get go (you’ll thank me in years to come). After rambling on( apologies), my main point in this review is to BUY IT. We all spend daily £17.50(smallest moisturiser), on a few bevvies down the pub, or when we decide to over-indulge on crisps and sour cream with our friends. So, go on, have a little gander and show the world, alike me, just how smooth as a babies bum, that face can be. Previous Post Karma, Karma, Karma, Karma, Karma….culottes? Eh?